What seems to be a long time ago in a meta far away, back in August of 2016 (almost two years ago), during the infancy of my TCG experience, a card that came into the game from the Steam Siege expansion set caught the eye of many a player, beginner and veteran alike. This card gave many of us pause and forced us to (GASP) actually do mathematics – specifically probability. 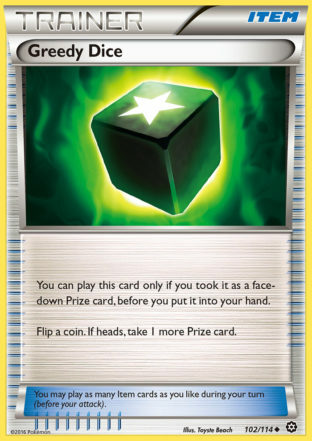 You see, Greedy Dice – if you pull it from your face down prize cards AND flip heads – allows you to take an extra prize card. Many of us instantly began the difficult task of calculating the probability of pulling Greedy Dice from your prizes and then cutting that in half for the coin flip. Although many variables affect this, we basically determined that the probability of pulling a Greedy Dice from your prizes and flipping heads was about 17%. The general consensus (and rightly so) disdained this card, and it fell into obscurity until about eleven months ago when Mike had the brilliant observation of combining Rotom Dex with Greedy Dice. Let it be fully documented here: unless someone can prove otherwise, there is no question in my mind that Mike was the first person to realize this combination. Back around April 16th or 17th, I had written my review for Rotom Dex, was perfectly content with it, and then Mike sent me an invite on PTCGO and says – as always – “Hey I’ve got this great combination….” And then I had to go and rewrite my entire review… and it’s probably my favorite review in the year plus I’ve been doing Pojo. As explained in the review, Rotom Dex allows you to potentially significantly increase that 17 percent number. If you have made it half way through you deck and you still have four Greedy Dice in your deck and you’re able to play Rotom Dex, you stand a GREAT chance of putting not just one but maybe two Greedy Dice into your prizes. Unfortunately, I tried this in twelve matches and only pulled Greedy Dice once, and that was upon KO’ing my opponent’s last Pokemon in play, so I didn’t even get the chance to flip the coin. And so Greedy Dice went back into the binder (or somewhere even more disdained if there is such a place) to wallow in the abyss of forgottenness again… until I played a Zoroark GX deck this weekend. My opponent was running Greedy Dice and a card that has seen significant attention over the past week: Oranguru UP 114. Yes, Resource Management allows you to throw those Greedy Dice – which make excellent Trade fodder by the way – back into your deck. Then you can Mallow for Rotom Dex, and – because you’ll probably have gone through the majority of your deck because it is, after all, Zoroark GX – you’ll have a high probability of putting at least one or two Greedy Dice into your prize cards. Apparently, the circle of the meta had spun back around, and I decided to give Greedy Dice a try again. I actually did pull a Greedy Dice AND it flipped heads!!!! What a feeling to take an extra prize card, and my opponent had to be going nuts on the other side of that. But you know what? I still lost the match. In the second game I was so obsessed with getting Greedy Dice in my prizes that I lost the game … and didn’t even take a single prize. But I’m sure I got some Greedy Dice into my prizes though. 1) It’s only two games, but I really think that there are five cards I’d rather have in the deck than some freaky green dice and Pokemon’s version of C3PO. 2) It’s super fun though when you pull it and it flips heads! 3) At least I can finally say that I pulled off a Greedy Dice once. 4) It’s amazing how a card can be completely worthless and then become potentially viable with the creation of a card in the future. And number four is the big lesson here: our meta is always changing. We should always be rethinking the way we do things. Just because a card is devoid of value today doesn’t mean that it will always be worthless. And that’s a big part of what I’ve come to love about this game. The lines on the pages of the rule book pretty much stay the same – it’s what’s written between those lines that constantly changes. Ha that is completely awesome! The problem with Greedy Dice is exactly as you stated. Deck space is finite and valuable. If you could expand your deck beyond 60, it might make more sense. Or if the condition was better than a coin flip. Heck “If your opponent has less prize cards than you…” would make Greedy Dice a nice equalizer for decks where you specifically fall behind. Yes you can make Greedy Dice happen, well if the coin gods allow it. However you need a deck where you’re getting prizes, and at that point, you can probably use better cards.